Now your favorite Forsaken character can look like a Deathguard with this outfit. However, unlike most of the other guard outfits on this site, the Deathguard outfit requires higher level, relatively harder-to-obtain gear to get a close match to the actual NPC’s look. LoL, bear with this article. I listed a lot of alternative pieces in case what I used is not accessible for your character. Hatchet, but any weapon of your choosing will work, too. 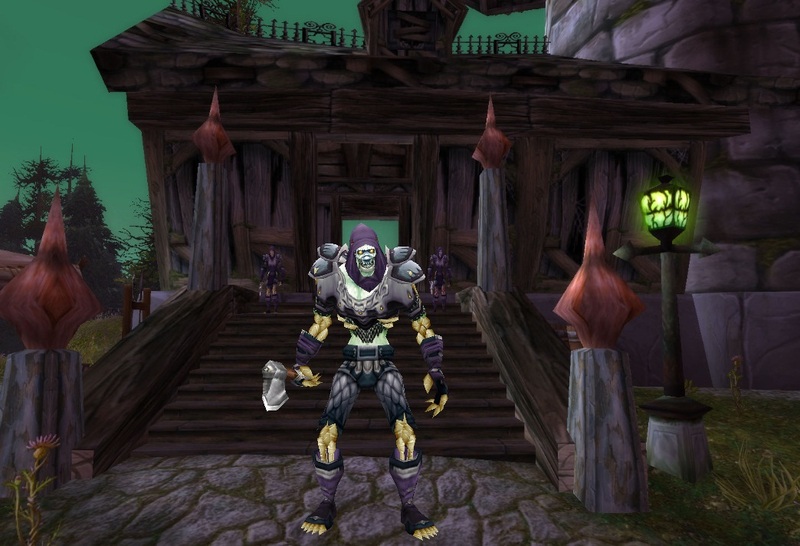 If you have the guild access, create a solid purple tabard to go with your outfit. This can only make it better! Ahhh, now let’s go through all the different items that could be substituted in for the ones I used. The crafted Shadow Hood, while the best match in color to the actual NPC’s hood, can be replaced with either the Consortium Hood or the Twilight Cultist Cowl. If you want to match more in the style of the guard’s shoulders, go with the Nightshade Spaulders. However, the colors in the actual Shadowcraft Spaulders (which match the heirloom ones used) match better with the NPC’s gear. The Double Link Tunic can be replaced for the Avenger’s Armor, or, you could try a different route and go with either the Blackforge Breastplate or the Scalemail Vest, both of which match the pants that were used. Other belt options include: the Blackforge Girdle, the Silver Defias Belt, and even the Barbaric Cloth Belt. The only other glove option that I found would match this outfit were the Shadowcraft Gloves. The Blackforge Leggings are an identical match to the Scalemail Pants that were used, as are the Mithril Scale Pants and the Stormbreaker’s Leggings. Other boots to consider are the Malignant Footguards (an identical match to those used in the outfit…but will probably not be accessible in Cataclysm), the Frozen Boots, and the Shadowstep Striders (the last two boot options will match in color, but not in style). I hope you enjoy putting together, and wearing, your Deathguard outfit!